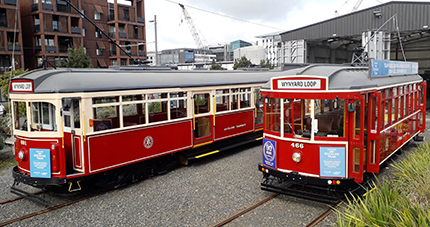 After 55 years, the Auckland tramway is back in action and original condition trams sourced out of Melbourne, Australia are gracing the streets of New Zealand's largest city once more with Auckland Dockline Tram. Halsey Street was named after Sir Lionel Halsey who captained the battle cruiser HMS New Zealand - so named because it was funded by the NZ government - during WWI. He was also in charge of the HMS New Zealand on her 1913 cruise of the Dominions, including NZ, to show off the flag. Halsey was regarded highly by local Maori warriors who gave him a Maori costume to wear during his battles. Sir Halsey's ship emerged from its battles without a scratch and with no fatalities. Click here to read more about the Halsey Street stop with Auckland Dockline Tram. Gaunt Street was the original site of City Depot, the tram shed for the tramway that served Auckland for the first half of the 20th century. The street was named after Admiral Sir E.F.A Gaunt, aide-de- camp to King George V, who served in the British forces at the Battle of Jutland. Read more about the Gaunt Street stop with Auckland Dockline Tram. Daldy Street gets its name from Captain William ‘Crush’ Daldy who was first chairman of the Auckland Harbour Board 1871-1877. 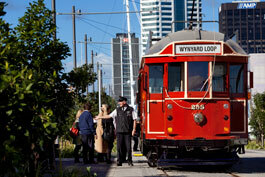 Find out more about the Daldy Street stop - third stop on the Auckland Dockline Tram route. This street was named after the right honourable Jellicoe of Scapa, Second Sea Lord who commanded the Grand Fleet in WW1. After the war, in 1919, Lord Jellicoe went on the HMS New Zealand Dominions’ tour and, in 1920, was appointed second Governor General of New Zealand. Lord Jellicoe was patron of almost every yacht club in New Zealand. 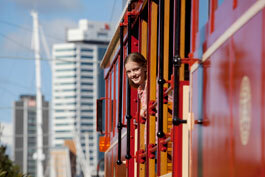 Read more about the Jellicoe Street stop with Auckland Dockline Tram.